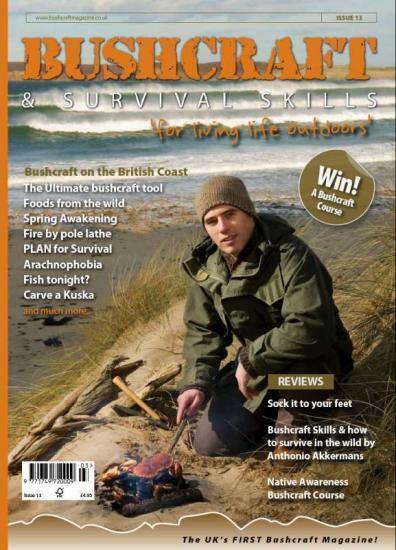 Bushcraft & Survival Skills is the UK's first bushcraft magazine, based in Thurso, Caithness. They have just received a wonderful letter and footage from 3 troop, 8 Armoured Engineer squadron, 26 regiment, based in Helmand, Afghanistan with 1Royal Anglian Battle Group. SSgt John Francis, received the publication, Bushcraft & Survival Skills Magazine, from his wife, who sends copies of the magazine out regularly to keep up morale. SSgt Francis commented, 'To help keep the lads entertained I thought that I would impress them with my knowledge of bushcraft and try to pass some on to them'. The film shows that it certainly does that, as the troops attempt to make a fire using the fire-saw article written by fire lighting expert, Dave Watson, founder of Woodland Survival School based in Derbyshire. After much time, energy, sweat and laughter the troop only have a little smoke and lots of sweat to show for their hard work. in the end they resort to using one of their cigarettes to create the ember! To view the film, visit www.bushcraftmagazine.com and click the sticker on the homepage. The staff at Bushcraft & Survival Skills Magazine have thoroughly enjoyed watching their film, shot by 'John Boy' (LCpl Astbury). In fact, they have arranged places for them on one of Dave Watson's fire lighting courses at the end of March where they will develop their fire lighting skills and pursue their interest in bushcraft. Interest in bushcraft is rapidly growing, helped by television programmes such as those by bushcraft expert, Ray Mears, whose programmes have a viewing of over 200 million worldwide. Entrepreneurs, Simon Ellar and his wife, Olivia, raised in Burton-on-Trent, have always had an interest in Bushcraft and Wilderness Living and their vision is being realised as they have moved to Caithness in the Scottish Highlands, referred to as the UK's 'last wilderness'. There they run their growing publication, with subscriptions going all over the world, including most European countries, Australia, New Zealand, USA and Canada. Simon and Olivia live a bushcraft lifestyle on a daily basis, currently having no running water or heating as they renovate an Old Schoolhouse. With three young children and one on the way, a renovation project and running their own business, this couple really show that they have the determination and drive to achieve their initial goal of increasing interest in bushcraft and making this information widespread and readily available. The articles in the magazines are written by experts throughout the country, who run their own bushcraft and survival schools. You only have to see a copy of the magazine to appreciate the high quality of the publication, which is printed, using vegetable-based inks on FSC paper (paper certified by the Forest Stewardship Council). The high quality images leap off the pages and informative text make it a joy to read; it is definitely worth seeing a copy. Simon, the editor of Bushcraft & Survival Skills Magazine, has offered to donate 1000 free issues to members of the army serving in Afghanistan, and, in addition to their places on one of Dave's courses, is sending a fire steel to the guys in the film so that they always have a backup, even when they are out of cigarettes! For more information about Bushcraft & Survival Skills Magazine, visit www.bushcraftmagazine.com where the film produced by the soldiers is available to view - or visit their stand at The Great Outdoors Show, NEC Birmingham, 14th-16th March, where they are hosting 'The Wilderness Camp', a feature of the show. Amongst other things you will have the opportunity to meet the bushcraft experts in person, watch demonstrations, try your hand at fire lighting and taste some camp cooking.